Time for the latest edition in the possibly neverending megahype-funtime-supergroup-series. 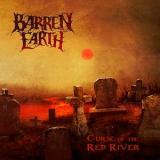 Today’s case study, Barren Earth, comes from Finland with their commendable debut LP, Curse of the Red River, lighting up reviewers and audiences alike. And why not? With Mikko Kotamäki (Swallow The Sun, Alghazanth) on vocals, Sami Yli-Sirniö (Kreator, Waltari) and Janne Perttilä (Rytmihäiriö) on guitars, Marko Tarvonen (Moonsorrow) on drums, Oppu Laine (Mannhai) on bass and Kasper Mårtenson (Ben Granfeldt Band) on keyboards, the potential is evident. Looking at most of the bands mentioned and especially considering that both Laine and Mårtenson are also former members of Amorphis, it’s not a wonder that the Nordic melancholy is ever present. Concerning musical stylistics, the press release namedrops bands like Opeth, Paradise Lost, Pink Floyd and even Jethro Tull. The heavy, occasionally twisted riffs combined with the moody keyboards certainly recall Opeth and the dark melodies executed well throughout make the Paradise Lost-comparison accurate. As for the masters of 70s prog, we’re moreso talking about hints and moments of similarity, in my mind. The title track opens up with the kind of eerie keyboards and lead guitars that definitely make you think of Åkerfeldt and company. Kotamäki shines through with his murderous growls s well as the somewhat subtle yet effective clean vocals, backed up by nicely crunching guitars. But what about the trademark Zakk Wylde-style pinch harmonics? Ok, let’s not go nitpicking that far. They’re cool, actually. Brings in the rock. After the middle part, an acoustic section backs up a nice flute solo, which could be the closest this album gets to really touching on Jethro Tull. Then again, I’m a huge Tull-fan so I can appreciate it. Other definite standouts include Our Twilight, which brings out the expected Amorphis-vibes with heavy delight and a great chorus; Flicker, an acoustically driven gem that is mostly quite mellow and sweet except for the heavy start and devastating double kick-drum flurries accompanied by Ghost Reveries-style keyboards (awesome dynamics throughout the song); and The Ritual Of Dawn, which could be the proggiest track on the album with the off-beat tempo dabbling and combing a piano-led middle section with a powerful guitar solo backed up by marching-type drums for a really imposing feel. The disc is very appropriately closed by Deserted Morrows, which opens up with smashing, slightly doomy riffs that eventually morph from faster, rhythmically jabbing moments to a full on double-bass assault with string sections and keyboard solos raising the mood to quite epic levels. Definitely liking this grandiose ending. Production-wise everything is of a very high quality and every sounds as crushing as you’d want to. The funniest thing about Curse of the Red River is that the old idea of “mellow parts are in heavy songs to make the heavy parts feel better and even more heavy” is almost turned upside down here. The album is predominantly distorted mauling, but the mellow and atmospheric parts are so good that listening through to the album I almost get the feeling that it’s the heavy parts that are better accommodating to distinguish the greatness of the softer parts. In any case, this is one great debut album from an accomplished set of musicians. It’d be a definite Surprise of the Month, if not for the fact that knowing the backgrounds of these guys didn’t make the high quality herein all that surprising. Hopefully these guys will find time to make more music under the Barren Earth-banner because I could only assume that with more time spent on the road and in the rehearsal caves, even better material could be unearthed.